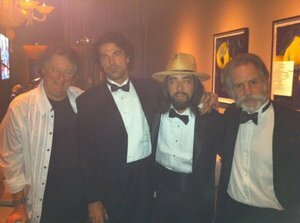 Rob Wasserman, Jay Lane, Jackie Greene, Bob Weir. Photo from Facebook. Last Wednesday, there was quite the epic private benefit at Quince (for Casa de Milagros, which benefits orphans in Peru). Let’s start with the sound stage, complete with Oriental rugs, set up in the middle of the restaurant (I know, wild). A tablehopper reader who attended the fundraiser said there was a performance by Scaring the Children, which includes ~Bob Weir~ (formerly of the Grateful Dead), ~Rob Wasserman~, and ~Jay Lane~—~Jackie Greene~ also played with them on the last few songs (I randomly found the setlist here if you’re interested). Some Glide Memorial Church choir members also sang with ~Sara Wasserman~. ~Ronnie Lott~ and ~Dwight Clark~ of the 49ers spoke about the charity, and even ~Joe Montana~ came on the stage in a special surprise appearance (he was having dinner next door at Cotogna).